How I Killed Pluto (And Why It Had It Coming) [Audiobook Review] – my books. my life. 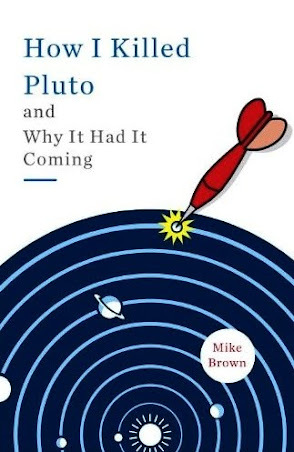 Mike Brown claims responsibility for Pluto’s demotion from one of the nine planets in our solar system. How I Killed Pluto tells the story of his search for the tenth planet that led to Pluto’s demise. I understood that Pluto was different, but I, like a lot of people, just loved Pluto. So I wanted to hear the story from the man responsible. But it turns out the story isn’t really that complicated. Or it wasn’t the way Brown told it. To make up for the lack of substance, he weaves in his personal life. While I found some of it interesting solely due to my own situation (like listening to his newborn experience while nursing my days-old baby), I really didn’t read this book to find out Mike Brown’s personal life story. I wanted Pluto’s. So I was disappointed. There were moments I enjoyed this book, but overall, I would pass on it. With first person nonfiction, I often have a hard time remembering that the narrator is not the author. To my brain, Gesell IS Brown. Which I think means the audiobook production was successful. Unfortunately, it wasn’t enough to redeem the book. I miss having 9 planets too, but I don’t see why we have to make a fuss over it. Our knowledge of the universe is constantly expanding, so there are bound to be some changes! Yeah, based on the title, I wouldn’t have expected a memoir and probably would have been disappointed as well. It seems that there probably wasn’t enough meat in the story to really pull this one off as labeled. At least it had a great narrator! awesome website, I’m so glad I stumbled onto it through my friend’s blog. Pingback: The Pluto Files: The Rise and Fall of America’s Favorite Planet [Audiobook Review] | my books. my life. I have this book! and I haven’t been able to finish it. It sits forlorn (like little Pluto) alone and unloved… I bet I would like it more on audio; it would just ‘get done’ if I could do other things while spending time with it.